Chemical peels are a perfect way to pamper yourself and great monthly maintenance for your skin because they are quick, painless and effective. Oklahoma Skin Care offers two chemical peels for our patients; Skinceuticals and Image Skincare. We also carry complete product lines of both. This helps patients to complement in-office peels with at-home regimens. We believe that long-lasting comprehensive results are achieved by combining state-of-the-art in-office procedures, advanced homecare, and professional treatments. Integrated Skincare is a program built around this belief. Skin health improvement starts with in-office procedures that address key concerns such as wrinkles, laxity, and unwanted discoloration. 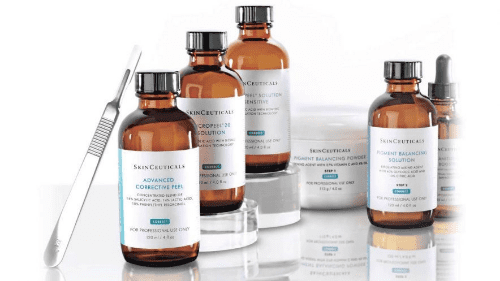 SkinCeuticals advanced homecare complements and protects these results by helping to prevent the appearance of future damage, protect healthy skin, and further correct visible signs of aging. In-office professional treatments, such as SkinCeuticals chemical peels and anti-aging protocols, synergistically complement in-office procedures and homecare. Our signature, results-driven treatment will change the Image of your skin in just one session. Vitamin C, alpha and beta hydroxy acids, and gentle yet effective enzymes and speed up cellular turnover lightening, tightening and brightening all skin types, even Rosacea and sensitive skin. Beautiful skin starts with healthy skin. The circle of skin health consists of highly effective professional treatments perfectly customized to specific skin conditions. The facial peels available in our I PEEL line can be combined with the I ENHANCE line, offering unmatched customization options. Lift your skin to a new level of health by targeting your skin concern. Oklahoma Skin Care will help you decide which peel is optimal for your skin care needs. The recommended number of treatments for optimal results varies based on your skin's condition and desired results. Please call today to schedule your free consultation.